George III (George William Frederick; June 4, 1738 – January 29, 1820) was King of Great Britain and King of Ireland from October 25, 1760 until January 1, 1801, and thereafter King of the United Kingdom of Great Britain and Ireland until his death. He was concurrently Duke of Brunswick-Lüneburg, and thus Elector (and later King) of Hanover. The Electorate became the Kingdom of Hanover on October 12, 1814. He was the third British monarch of the House of Hanover, and the first to be born in Britain and speak English as his first language. It was during George III's reign that Great Britain lost many of its colonies in North America in the wake of the American Revolution. These colonies would eventually become the United States. Also during his reign, the realms of Great Britain and Ireland were joined together to form the United Kingdom. While this union was his greatest accomplishment, he is more well known for, and his significance in history is far outweighed by, his failure to grasp the historical moment that was the American Revolution, which would change the course of world history, creating for the first time a truly free people and a country based not simply on common ethnicity but on an ideal and vision presumed to come from God. Later in his reign George III suffered from recurrent and, eventually, permanent mental illness that has been generally thought to have resulted from the blood disease porphyria. Recently, studies showing high levels of the poison arsenic in King George's hair have lent support to the view that arsenic may by been a possible cause of King George's insanity and health problems. After George III's final relapse in 1810, his eldest son, George, Prince of Wales ruled as Prince Regent. Upon George III's death, the Prince of Wales succeeded his father as King George IV. His Royal Highness Prince George of Wales was born at Norfolk House on June 4, 1738. He was the son of Frederick, Prince of Wales, and the grandson of George II. Prince George's mother was Augusta of Saxe-Gotha. As Prince George was born prematurely, he was baptized that same day at Norfolk House by the Bishop of Oxford, Thomas Secker. He was publicly baptized again at Norfolk House by Secker, on July 4, 1738. His godparents were the King of Sweden (for whom Lord Baltimore stood proxy), the Duke of Saxe-Gotha (for whom James Brydges, First Duke of Chandos stood proxy) and the Queen of Prussia (for whom Lady Charlotte Edwin, a daughter of the Duke of Hamilton, stood proxy). George II and Prince Frederick of Wales had an extremely poor relationship. In 1751 the Prince of Wales died from a lung injury, and Prince George became the Duke of Edinburgh. The new Duke of Edinburgh was Heir Apparent to the throne, and was subsequently made Prince of Wales in 1751. His mother, now the Dowager Princess of Wales, mistrusted her father-in-law; thus, she kept Prince George of Wales separate from his grandfather. 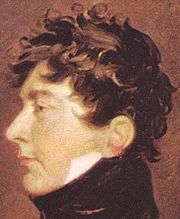 An important influence on the new Prince of Wales's childhood was Lord Bute, who would later serve as Prime Minister. George, Prince of Wales inherited the Crown when his grandfather, George II, died on October 25, 1760. After his accession, a search throughout Europe ensued for a suitable wife. On September 8, 1761, the king married Duchess Sophia Charlotte of Mecklenburg-Strelitz in the Chapel Royal, St. James's Palace, London. A fortnight later, both were crowned at Westminster Abbey. It is said that George was smitten with Lady Sarah Lennox, daughter of Charles Lennox, Second Duke of Richmond, and actually winced when he first saw the homely Charlotte, whom he met on their wedding day. However, he gamely went ahead with his marriage vows, and, remarkably, never took a mistress (in contrast to both his Hanoverian predecessors and his sons). The couple enjoyed a genuinely happy marriage. They had 15 children—nine sons and six daughters, more than any other British monarch with the exception of Queen Anne, who had 17 children, none of which lived to adulthood. Two sons, George, Prince of Wales and William, Duke of Clarence, became kings of the United Kingdom; another became solely King of Hanover; a daughter became Queen of Württemberg. George III was the grandfather of Queen Victoria, who was the daughter of his fourth son, Prince Edward Augustus, Duke of Kent and Strathearn. The rest of the 1700s were marked by bureaucratic bungling, which led to denunciations of George III by the Whigs as an autocrat in the manner of Charles I. John Stuart, Third Earl of Bute (who had probably been appointed only because of his agreement with George's views on royal power) resigned in 1763, allowing the Whigs to return to power. Later that year, the British government under George III issued the Royal Proclamation of 1763 that placed a boundary upon the westward expansion of the American colonies. The proclamation's goal was to force colonists to negotiate with the Native Americans for the lawful purchase of the land and, therefore, to reduce the costly frontier warfare that had erupted over land conflicts. The Proclamation Line, as it came to be known, was incredibly unpopular with the Americans and ultimately became another wedge between the colonists and the British government, which would eventually lead to war. With the American colonists generally unburdened by British taxes, it was becoming increasingly difficult for the crown to pay for its military excursions and the defense of the American colonies from native uprisings. So, after George Grenville became Prime Minister, he introduced the Stamp Act, which levied a stamp duty on all printed paper in the British colonies in North America. 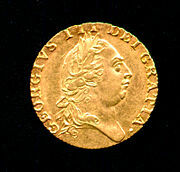 Grenville attempted to reduce George III to a mere puppet. The King requested William Pitt the Elder to accept the office of Prime Minister, but was unsuccessful. George then settled on Lord Rockingham, and dismissed Grenville in 1765. Lord Rockingham repealed Grenville's unpopular Stamp Act. He faced considerable internal dissent, and was replaced in 1766 by Pitt, whom George made Earl of Chatham. Lord Chatham proved to be pro-American, criticizing his colleagues' harsh attitudes towards the American colonists. George III, however, deemed that the chief duty of the colonists was to submit to him and to Great Britain and he resented the Americans' rebellious attitude. Lord Chatham fell ill in 1767, allowing Augustus FitzRoy, Third Duke of Grafton, to take over government, although he did not formally become Prime Minister until 1768. Political attacks led him to leave office in 1770, once again allowing the Tories to return to power. The government of the new Prime Minister, Lord North, was chiefly concerned with the American Revolution. The Americans grew increasingly hostile to British attempts to levy taxes in the colonies. During the Boston Tea Party in 1773, a Boston mob threw 342 crates of tea into Boston Harbor as a political protest, costing approximately ten thousand Pounds (almost $20,000). In response, Lord North introduced the Punitive Acts, known as the Coercive Acts or the Intolerable Acts by the colonists. The Port of Boston was shut down and legislative elections in the Colony of Massachusetts Bay were suspended. The American Revolutionary War began when armed conflict between British regulars and colonial militiamen broke out in New England in April 1775. A month later, 13 of the British colonies sent delegates to the Second Continental Congress, which had been called to meet in May by the First Continental Congress the previous October. With the fighting already underway when Congress convened, the delegates drafted a peace proposal known as the Olive Branch Petition. The proposal was quickly rejected in London because fighting had already erupted. A year later, on July 4, 1776, (American Independence Day), the provinces declared their independence from the Crown and became a new nation, the "United States of America." The Declaration of Independence was a long list of grievances against the British King, legislature, and populace. Amongst George's other offences, the declaration charged, "He has abdicated Government here. He has plundered our seas, ravaged our coasts, burnt our towns, and destroyed the lives of our people." On the same day, George III wrote "Nothing important happened today" in his diary. While the diary passage itself is not indicative of George III's opinion of the declaration, as communication at the time was not instantaneous, this statement has been used by fiction writers as a comment on historical irony. George III was indignant when he learned of the opinions of the colonists. In the American Revolution the British captured New York City in 1776, but the grand strategic plan of invading from Canada became a great American victory with the surrender of the British Lieutenant-General John Burgoyne at the Battle of Saratoga. In 1778 France signed a treaty of friendship with the new United States. Lord North asked to transfer power to Lord Chatham, whom he thought more capable. George III, however, refused to hear such suggestions; he suggested that Chatham serve as a subordinate minister in Lord North's administration. Chatham refused to cooperate, and died later in the same year. Great Britain was then at war with France, and in 1779 it was also at war with Spain. George III obstinately tried to keep Great Britain at war with the rebels in America, despite the opinions of his own ministers. Lord Gower and Lord Weymouth both resigned rather than suffer the indignity of being associated with the war. Lord North advised George III that his opinion matched that of his ministerial colleagues, but stayed in office. George III gave up hope of subduing America by sending more armies. "It was a joke," he said, "to think of keeping Pennsylvania." There was no hope of ever recovering New England. But the King was determined "never to acknowledge the independence of the Americans, and to punish their contumacy by the indefinite prolongation of a war which promised to be eternal." His plan was to keep the thirty thousand men garrisoned in New York, Rhode Island, Canada, and Florida; other forces would attack the French and Spanish in the West Indies. To punish the Americans, the king planned to destroy their coasting-trade, bombard their ports, sack and burn towns along the coast (such as New London and Connecticut), and turn loose the Indians to attack civilians in frontier settlements. These operations, the king felt, would inspire the Loyalists, would splinter the Congress, and "would keep the rebels harassed, anxious, and poor, until the day when, by a natural and inevitable process, discontent and disappointment were converted into penitence and remorse" and they would beg to return to his authority. The plan meant destruction for the Loyalists and loyal Indians, and indefinite prolongation of a costly war, as well as the risk of disaster as the French and Spanish were assembling an armada to invade the British isles and seize London. In 1781, the news of Lord Cornwallis's surrender at the Siege of Yorktown reached London; the Tory Lord North subsequently resigned in 1782. George III finally accepted the defeat in North America, and authorized the negotiation of a peace. The Treaty of Paris and the associated Treaty of Versailles were ratified in 1783. The former treaty provided for the recognition of the United States by Great Britain. The latter required Great Britain to cede Florida to Spain and to grant access to the waters of Newfoundland to France. 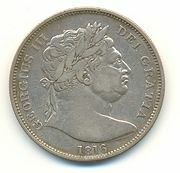 Half-Crown coin of George III, 1816. In 1782, after 12 years in office, the ministry of Lord North collapsed. The Whig Lord Rockingham became Prime Minister for the second time, but died within months. The king then chose Lord Shelburne to replace him. Charles James Fox, however, refused to serve under Shelburne, and demanded the appointment of the Duke of Portland. In 1783, the House of Commons forced Lord Shelburne from office and his government was replaced by the Fox-North Coalition. The Duke of Portland became Prime Minister. Fox and Lord North, Foreign Secretary and Home Secretary respectively, were the men actually in power, with Portland acting as a figurehead. George III was distressed by the attempts to force him to appoint ministers not of his liking. But the Portland ministry quickly built up a majority in the House of Commons, and could not be easily displaced. He was, however, extremely dissatisfied when the government introduced the India Bill. Immediately after the House of Commons passed it, George informed the House of Lords that he would regard any peer who voted for the bill as his enemy. On December 17, 1783, the bill was rejected by the Lords; on the next day, the Portland ministry was dismissed, and William Pitt the Younger was appointed Prime Minister. George III dissolved Parliament in March 1784; the subsequent election gave Pitt a firm mandate. For George III, Pitt's appointment was a great victory. The king felt that the scenario proved that he still had the power to appoint prime ministers without having to rely on any parliamentary group. Throughout Pitt's ministry, George eagerly supported many of his political aims. To aid Pitt, George created new peers at an unprecedented rate. The new peers flooded the House of Lords and allowed Pitt to maintain a firm majority. During Pitt's ministry, George III was extremely popular. The public supported the exploratory voyages to the Pacific Ocean that he sanctioned. George also aided the Royal Academy with large grants from his private funds. The British people admired their king for remaining faithful to his wife, unlike the two previous Hanoverian monarchs. Great advances were made in fields such as science and industry. George III's health, however, was in a poor condition. He suffered from a mental illness, now strongly believed to be a symptom of porphyria. A 2004 study of the king's hair samples revealed high levels of arsenic, a possible trigger of the disease. The King had previously suffered a brief episode of the disease in 1765, but a longer episode began in 1788. Though ill during the summer of 1788, George was sufficiently sane to suspend Parliament from September 25 to November 20. During the intervening time, however, he became seriously deranged and posed a threat to his own life. When Parliament reconvened in November, the king could not, as was customary, communicate to them the agenda for the upcoming legislative session. According to long-established practice, Parliament could not begin the transaction of business until the king had made the speech from the throne. Parliament, however, ignored the custom and began to debate provisions for regency. Charles James Fox and William Pitt wrangled over which individual was entitled to take over government during the illness of the Sovereign. Although both parties agreed that it would be most reasonable for George III's eldest son and heir-apparent, the Prince of Wales, to act as Regent, they disagreed over the basis of regency. Fox suggested that it was the Prince of Wales's absolute right to act on his ill father's behalf; Pitt argued that it was for Parliament to nominate a regent. Proceedings were further delayed as the authority for Parliament to merely meet was questioned, as the session had not been formally opened by the Sovereign. Pitt proposed a remedy based on an obscure legal fiction. As was well-established at the time, the Sovereign could delegate many of his functions to Lords Commissioners by letters patent, which were validated by the attachment of the Great Seal of the Realm. It was proposed that the custodian of the Great Seal, the Lord Chancellor, affix the Seal without the consent of the Sovereign. Although such an action would be unlawful, it would not be possible to question the validity of the letters patent, as the presence of the Great Seal would be deemed conclusive in court. George III's second son, Prince Frederick, Duke of York, denounced Pitt's proposal as "unconstitutional and illegal." Nonetheless, the Lords Commissioners were appointed and then opened Parliament. In February 1789 the Regency Bill, authorizing the Prince of Wales to act as Prince Regent, was introduced and passed in the House of Commons. But before the House of Lords could pass the bill, George III recovered from his illness under the care of Dr Francis Willis. He confirmed the actions of the Lords Commissioners as valid, but resumed full control of government. After George recovered from his illness, his popularity greatly increased. The French Revolution, in which the French monarchy had been overthrown, worried many British landowners. France subsequently declared war on Great Britain in 1793, and George soon represented the British resistance. George allowed Pitt to increase taxes, raise armies, and suspend the privilege of the writ of habeas corpus in the war attempt. As well-prepared as Great Britain may have been, France was stronger. The First Coalition (which included Austria, Prussia, and Spain) was defeated in 1798. The Second Coalition (which included Austria, Russia, and the Ottoman Empire) was defeated in 1800. Only Great Britain was left fighting Napoleon Bonaparte, the military dictator of France. Perhaps surprisingly, the failed assassination attempt of George III on May 15, 1800, was not political in origin, but motivated by the religious delusions of his assailant, James Hadfield, who shot at the king in the Drury Lane Theatre during the playing of the national anthem. Soon after 1800 a brief lull in hostilities allowed Pitt to concentrate on Ireland, where there had been an uprising in 1798. Parliament then passed the Act of Union 1800, which, on January 1, 1801, united Great Britain and Ireland into a single nation, known as the United Kingdom of Great Britain and Ireland. George used the opportunity to drop the claim to the throne of France, which English and British sovereigns had maintained since the reign of Edward III. It is sometimes suggested that George dropped the claim folloeing the Treaty of Paris or the Treaty of Amiens. Chronologically, neither would be logical; the Treaty of Paris was signed in 1783, and the Treaty of Amiens in 1802 (after George dropped his claim to the throne of France.) It was suggested that George adopt the title "Emperor of the British and Hanoverian Dominions," but he refused. 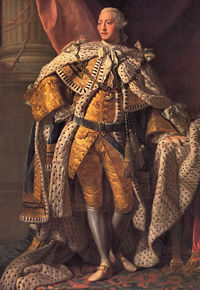 A. G. Stapleton writes that George III "felt that his true dignity consisted in his being known to Europe and the world by the appropriated and undisputed style belonging to the British Crown." Where is the power on Earth to absolve me from the observance of every sentence of that oath, particularly the one requiring me to maintain the Protestant Reformed Religion? No, no, I had rather beg my bread from door to door throughout Europe, than consent to any such measure. I can give up my crown and retire from power. I can quit my palace and live in a cottage. I can lay my head on a block and lose my life, but I cannot break my oath. Faced with opposition to his religious reform policies, Pitt threatened to resign. At about the same time, the king suffered an attack of insanity, but quickly recovered. On March 14, 1801, Pitt was formally replaced by the Speaker of the House of Commons, Henry Addington. As Addington was his close friend, Pitt remained as a private advisor. Addington's ministry was particularly unremarkable, as almost no reforms were made or measures passed. In fact, the nation was strongly against the very idea of reform, having just witnessed the bloody French Revolution. Although they called for passive behavior in the United Kingdom, the public wanted strong action in Europe, but Addington failed to deliver. In October 1801 he made peace with the French, and in 1802 signed the Treaty of Amiens. George did not consider the peace with France as "real"; it was more of an experiment. In 1803 the two nations once again declared war on each other. In 1804 George was again affected by his porphyria; as soon as he was able to continue his rule, he discovered that Addington was displeasing the public, who did not trust him to lead the nation into war. Instead, the public tended to put more faith in William Pitt the Younger. Pitt sought to appoint Charles James Fox to his ministry, but George III refused. The king disliked Fox, who had encouraged the Prince of Wales to lead an extravagant and expensive life. Lord Grenville perceived an injustice to Fox, and refused to join the new ministry. Pitt concentrated on forming a coalition with Austria, Russia, and Sweden. The Third Coalition, however, met the same fate as the First and Second Coalitions, collapsing in 1805. An invasion by Napoleon seemed imminent, but the possibility was extinguished after Admiral Lord Nelson's famous victory at the Battle of Trafalgar. The setbacks in Europe took a toll on William Pitt's health. Pitt died in 1806, once again reopening the question of who should serve in the ministry. Lord Grenville became prime minister, and his "Ministry of All the Talents" included Charles James Fox. The king was extremely distressed that he was forced to submit to the appointment. After Fox's death in September 1806, the king and ministry were in open conflict. The ministry had proposed a measure whereby Roman Catholics would be allowed to serve in the Armed Forces. George not only instructed them to drop the measure, but also to make an agreement to never set up such a measure again. The ministers agreed to drop the measure then pending, but refused to bind themselves in the future. In 1807 they were dismissed and replaced by the Duke of Portland as the nominal prime minister, with actual power being held by the Chancellor of the Exchequer, Spencer Perceval. Parliament was dissolved; the subsequent election gave the ministry a strong majority in the House of Commons. George III made no further major political decisions during his reign; the replacement of the Duke of Portland by Perceval was of little actual significance. In 1810, George III became dangerously ill, the malady possibly having been triggered by the death of his youngest and favorite daughter, Princess Amelia, from erysipelas or porphyria. Arsenic poisoning is also a possible cause. By 1811, George III had become permanently insane and was locked away at Windsor Castle until his death. Sometimes speaking for many hours without pause, he claimed to talk to angels. One day, on a drive through Windsor Great Park, the king threw his arms up into the air and shouted, "Stop!" He alighted, walked over to an oak tree and acted as if he was shaking hands with one of its branches. He spoke for several moments before a footman asked him if he was feeling well. The king replied, "Of course I am! Now don't interrupt me sir. I am talking to the King of Prussia." To treat his illness, his doctors gave him James's Powder (calomel and tartar emetic) and bled him regularly. They also advised him to bathe in the sea (thus encouraging seaside holidays). On inspecting his urine, doctors often found a bluish tint to it. Parliament then passed the Regency Act 1811, to which the Royal Assent was granted by the Lords Commissioners, appointed under the same irregular procedure as was adopted in 1788. The Prince of Wales acted as Regent for the remainder of George III's life. Spencer Perceval was assassinated in 1812 (the only British Prime Minister to have suffered such a fate) and was replaced by Robert Banks Jenkinson, Second Earl of Liverpool. Liverpool oversaw British victory in the Napoleonic Wars. The subsequent Congress of Vienna led to significant territorial gains for Hanover, which was upgraded from an electorate to a kingdom. Meanwhile, George's health deteriorated. Over the Christmas of 1819, he suffered a further bout of madness, spoke nonsense for 58 hours, then sank into a coma. On January 29, 1820, he died blind, deaf, and insane at Windsor Castle. George lived for 81 years and 239 days and reigned for 59 years and 96 days—in each case, more than any other English or British monarch up to that point. This record has been surpassed only once, by George's granddaughter Queen Victoria. George III's reign was longer than the reigns of all three of his immediate predecessors (Queen Anne, King George I and King George II) combined. George III was buried on February 16 in St. George's Chapel, Windsor. His death came six days after that of his fourth son, the Duke of Kent, the father of Queen Victoria. George was succeeded first by his eldest son George IV, and then another son, William IV. William IV, too, died without legitimate children, leaving the throne to his niece, Victoria, the last monarch of the House of Hanover. While tremendously popular in Britain, George was hated by rebellious American colonists who made up approximately one-third of the population in the colonies. The United States Declaration of Independence held him personally responsible for the political problems faced by the United States. The Declaration does not blame either Parliament or the ministers, and exposure to the views expressed in the Declaration has led the American public to perceive George as a tyrant. This view is, at worst, a historical consequence of the political climate of the times, wherein the state of the king's governing powers and mental health were practically unknown by the general public, and even less so by the distant North American colonies ruled under his crown. Another factor that exacerbated American resentment was the king's failure to intercede personally on the colonists' behalf after the Olive Branch Petition. Many modern British historians also place primary blame for the loss of the colonies on King George, largely because they attribute the Proclamation of Rebellion (which treated the colonies' complaints as acts of rebellion) to him. George was hated in Ireland for the atrocities carried out in his name during the suppression of the 1798 rebellion. There are many cities and towns in former British colonies that are named Georgetown. These may be named either after George III or his son, George IV. Statues of George III can be seen today in places such as the courtyard of Somerset House in London and in Weymouth, Dorset, which he popularized as a seaside resort one of the first in England. A statue of George III was pulled down in New York at the beginning of the War of Independence in 1776 and two engravings of its destruction still exist, although one is wholly inaccurate. The British Agricultural Revolution reached its peak under George III. The period provided for unprecedented growth in the rural population, which in turn provided much of the workforce for the concurrent Industrial Revolution. George III has been nicknamed Farmer George, for "his plain, homely, thrifty manners and tastes" and because of his passionate interest in agriculture. In Great Britain, George III used the official style "George the Third, by the Grace of God, King of Great Britain, France and Ireland, Defender of the Faith, etc." In 1801, when Great Britain united with Ireland, he took the opportunity to drop his claim to the French throne. He also dispensed with the phrase "etc.," which was added during the reign of Elizabeth I. His style became, "George the Third, by the Grace of God, King of the United Kingdom of Great Britain and Ireland, Defender of the Faith." Whilst he was King of Great Britain, George's arms were: Quarterly, I Gules three lions passant guardant in pale Or (for England) impaling Or a lion rampant within a double-tressure flory-counter-flory Gules (for Scotland); II Azure three fleurs-de-lys Or (for France); III Azure a harp Or stringed Argent (for Ireland); IV tierced per pale and per chevron (for Hanover), I Gules two lions passant guardant Or (for Brunswick), II Or a semy of hearts Gules a lion rampant Azure (for Lüneburg), III Gules a horse courant Argent (for Westfalen), overall an escutcheon Gules charged with the crown of Charlemagne Or (for the dignity of Archtreasurer of the Holy Roman Empire). When he became King of the United Kingdom, his arms were amended, dropping the French quartering. They became: Quarterly, I and IV Gules three lions passant guardant in pale Or (for England); II Or a lion rampant within a double tressure flory-counter-flory Gules (for Scotland); III Azure a harp Or stringed Argent (for Ireland); overall an escutcheon tierced per pale and per chevron (for Hanover), I Gules two lions passant guardant Or (for Brunswick), II Or a semy of hearts Gules a lion rampant Azure (for Lunenburg), III Gules a horse courant Argent (for Westfalen), the whole inescutcheon surmounted by an electoral bonnet. In 1816, two years after the Electorate of Hanover became a Kingdom, the electoral bonnet was changed to a crown. ↑ NPR. A Living Document Retrieved June 4, 2007. ↑ Trevelyan, George Otto. George the Third and Charles Fox: The Concluding Part of the American Revolution. vol 1. p. 4. 1912. ↑ Trevelyan, George Otto. George the Third and Charles Fox: The Concluding Part of the American Revolution. vol 1. p. 5. 1912. ↑ BBC. King Geore III: Mad of Misunderstood? Retrieved June 4, 2007; Ross, Emma. Madness of King George Linked to Arsenic Retrieved June 4, 2007. ↑ Royal Botanic Gardens, Kew. ‘Farmer’ George and His ‘Ferme Ornee’ Retrieved June 5, 2007. Ditchfield, G. M. George III: An Essay in Monarchy. 2003. Hibbert, Christopher. George III: A Personal History. Viking: London. 1998. ISBN 0-670-86941-4; George III: A Personal History Retrieved June 5, 2007. History of the Monarchy. George III (r. 1760–1820) Retrieved June 5, 2007. May, Thomas Erskine. The Constitutional History of England Since the Accession of George the Third, 1760-1860. 11th ed. Longmans, Green, and Co: London. 1896. Pares, Richard. King George III and the Politicians. 1953. King George III and the Politicians Retrieved June 5, 2007. Reitan, Earl Aaron. George III, Tyrant Or Constitutional Monarch? 1964. Trevelyan, George Otto. George the Third and Charles Fox: The Concluding Part of the American Revolution. 1912. George the Third and Charles Fox: The Concluding Part of the American Revolution vol. I Retrieved June 5, 2007; George the Third and Charles Fox: The Concluding Part of the American Revolution vol. II Retrieved June 5, 2007; George the Third and Charles Fox: The Concluding Part of the American Revolution Retrieved June 5, 2007. Watson, J. Steven. The Reign of George III, 1760-1815. 1960. The Reign of George III, 1760-1815 Retrieved June 5, 2007. History of "George III of the United Kingdom"
This page was last modified on 15 June 2017, at 22:08.